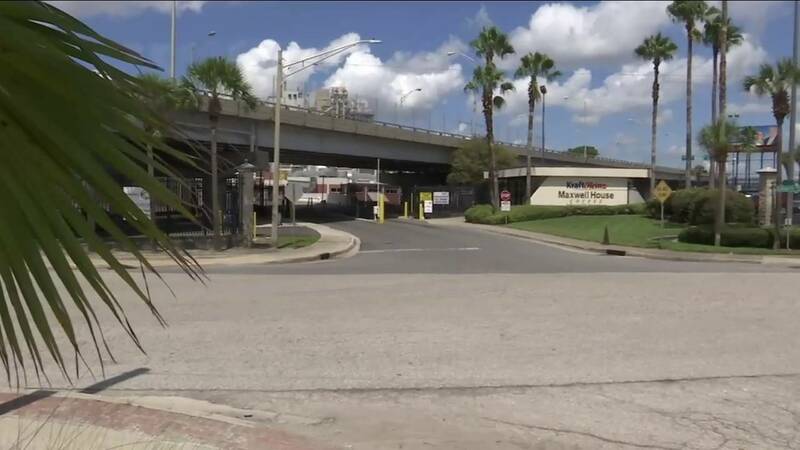 JACKSONVILLE, Fla. - The Department of Transportation will fund two projects in Jacksonville, including the removal of the Hart Bridge ramp running between TIAA Bank Fiend and Metro Park that was cited as a stumbling block to a proposed development of the long-vacant riverfront Shipyards property. In a tweet Thursday morning, Sen. Marco Rubio said the federal agency would fund both the Urban Core Riverside project -- the Hart ramp project -- and the Bay Street Innovation Corridor. Each project will receive $12.5 million. Nearly two years ago, the city of Jacksonville asked the federal government to pay for the demolition of the Hart Bridge ramps and relocate traffic between the bridge and downtown to surface roads to allow both for the riverfront development proposed by Jaguars owner Shad Khan and construction of an entertainment complex on what is now Lot J of the stadium. The city wants to replace the 50-year-old elevated western downtown access ramp of the Hart Bridge with a surface road, adding pedestrian and bike-friendly features. Additional plans identified in the grant include a new signalized intersection at Bay Street and Gator Bowl Boulevard, widening of Bay Street/Gator Bowl Boulevard, construction of a ramp at A. Philip Randolph Boulevard and other traffic-calming improvements. The second project for Bay Street will implement the first phase of the Ultimate Urban Circulator program, incorporating Smart City technology, enhance safety, efficiency and accessibility of a major east-west corridor in Jacksonville. Mayor Lenny Curry tweeted Thursday that Rubio called to give the good news. Curry also thanked U.S. Reps. John Rutherford and Al Lawson and the JTA team for "a tremendous team effort resulting in another win." “It is a great day for transportation in Jacksonville,” Curry said in a statement. “Our city scored two federal grants that will afford us the opportunity to enhance downtown access, improve traffic conditions and safety, and bolster innovation throughout our downtown footprint." Earlier this year, the federal government denied the city’s request for $25 million to make that vision a reality. This time, the city is seeking $12 million, or roughly half of the original funding request. In its latest proposal, the city said overhauling the existing road design would not only provide safer access to the riverfront and sports complex, it would also bring in $2.5 billion in new investments. The proposal said the move would help reduce flooding with the addition of new drainage systems to filter water runoff into the nearby St. Johns River. The total cost for the first phase of the project would be about $37.5 million. The city is expected to chip in $12.5 million of that, with $12.5 million already set aside by the state.